Yes, there is such a thing as a machine made long filler cigar, it's called the Finck Travis Club Especiale, and like all the Travis Club Classic cigars, it's available with a Connecticut Shade or dark maduro Connecticut Broadleaf wrapper. However, only the Especiale is 100% long filler, though the Senator and Corona are both a combination of long filler and cut filler, and if that doesn't please you, there's 9 other sizes of Travis Club Classics made with short filler to smoke. The best way to try these cigars is via the sampler, which contains 21 of these interesting cigars to enjoy. The cigars are well constructed, and are mild in strength and taste. I liked all of them, especially the maduros, which Finck seems to have a way with. A hundred years ago, these cigars were the private brand of the Travis Club in San Antonio, Texas. 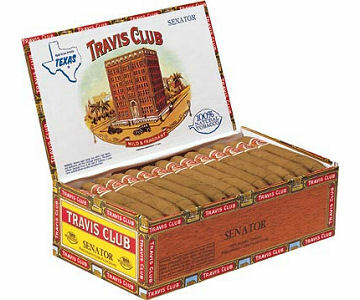 The club is long gone, but the name lives on with these and the Travis Club Premium brands. Finck cigars have long been a regional favorite, but thanks to the internet, they are now available to anyone.